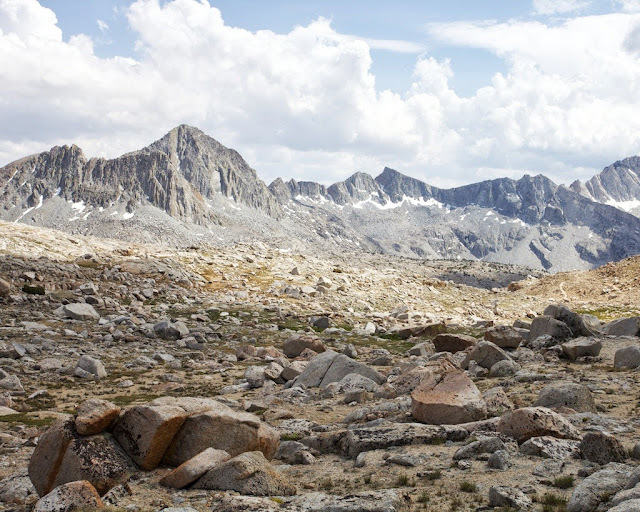 We raced over Bishop Pass, hiking so hard over the 11,973 pass that we could near our hearts pumping furiously in our ears as we passed the marker sign at the top. We were racing a monstrous front of ominous black clouds pouring over the nearest range - just to the west of us. Without stoping for more than a quick photo we rushed to the safety of lower elevation down in Dusy Basin. The storm would never fully materialize. There was no thunder. Never-the-less, we would be caught be surprise at the moment we least expected it causing a premature end to what was supposed to be a leasurley and relaxing three day backpacking trip through the back door of Kings Canyon National Park. We woke up early Friday morning with the first light in Rock Creek Canyon. 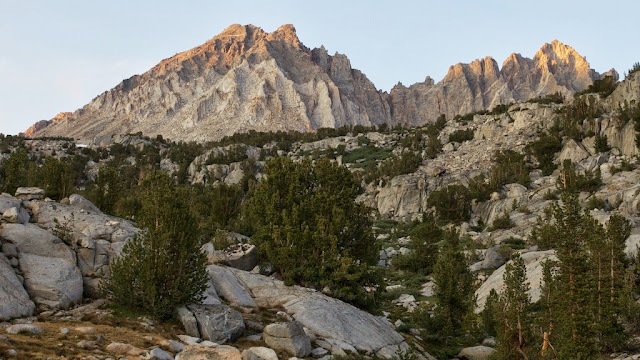 We packed up our gear and hustled quickly into Bishop to secure a permit for the holiday weekend taking up two of the last three slots left under the quota. After a quick stop a the the Erick Schat's Bakkerÿ for a bagel (a VERY good bagel too!) we were off to South Lake. 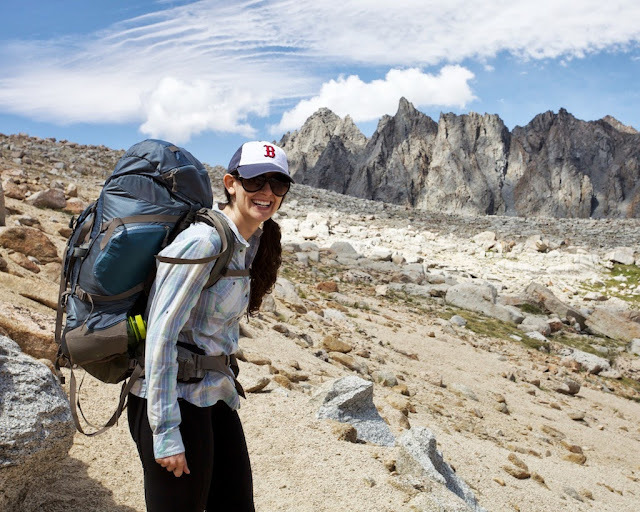 We pulled into the first parking spot we found and after quickly stashing some gear in the bear lockers we hit the trail mid-morning, though already and even at 9,500 feet, it felt like the full heat of the day. At least for the first mile. 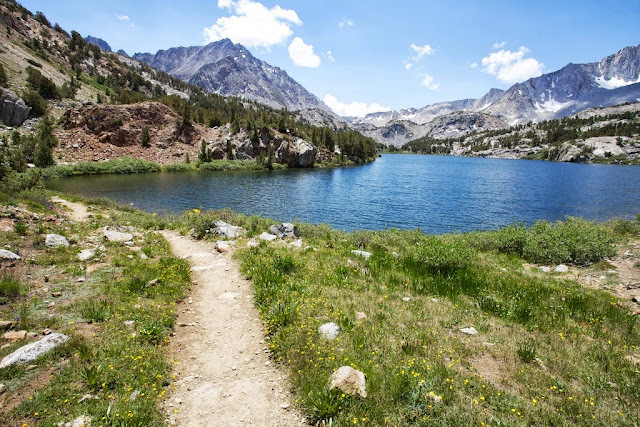 The trail climbs rather gradually until the junction with Marie Louise Lakes, about a mile and a half in. From there it switches back and forth up to Chocolate Lake - which sounds like a delicious place. Unfortunately Chocolate Lake is not literally a giant fondue pot and is most likely named for the reddish brown appearance of the peak its nestled at the base of - Chocolate Peak. From Chocolate Lake the trail continues to climb, though now much more gradually up to the wildflower fringed shore of Long Lake. For the next half mile or so, the trail eases around Long Lake where stopped for a while to pause, breathe, pump water, and get eaten by mosquitos. 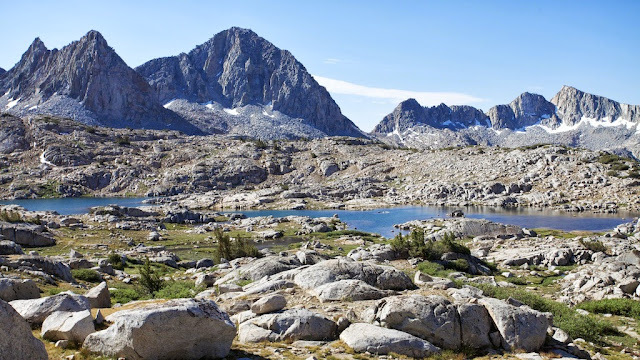 At the far shore of the lake the trail then begins its first real climb up to Bishop Lake. We pleased with our decision to smother our bodies in sun screen on the climb which was wide open and all kinds of exposed. After the climb we rested for a bit at Bishop Lake. 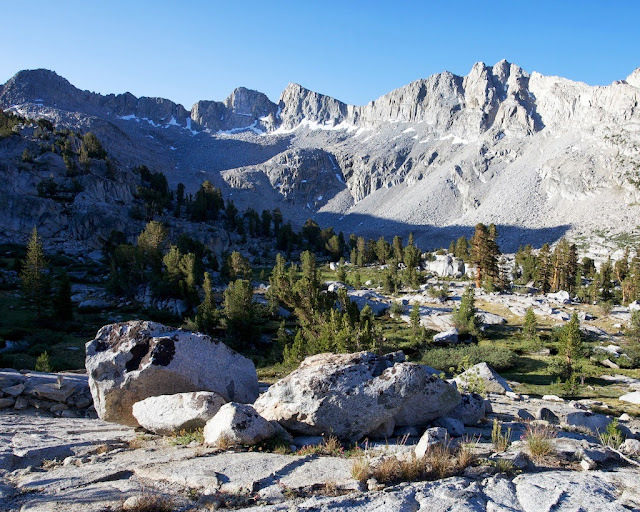 Bishop Lake is situated right at the tree line and it was there that we really started to feel the altitude. Past the lake, we made our way over one final creek crossing right as Bishop pass came into full view. 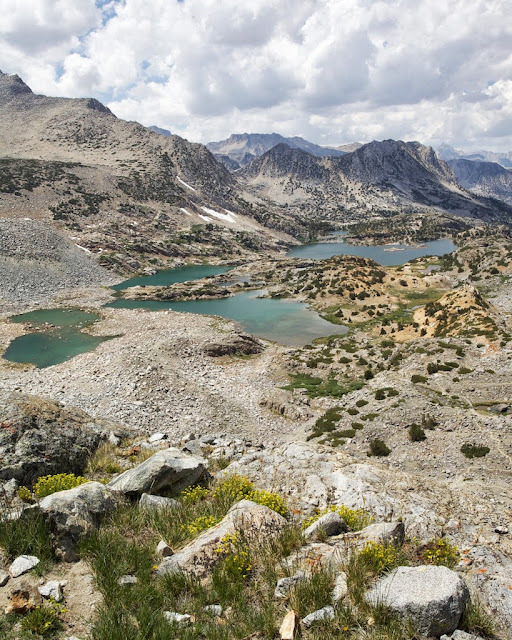 At its base at about 11,250 feet, the trail over Bishop Pass begins by climbing rather gradually. It undulates a bit making its way above the tree line and to the base of the first set of switchbacks. 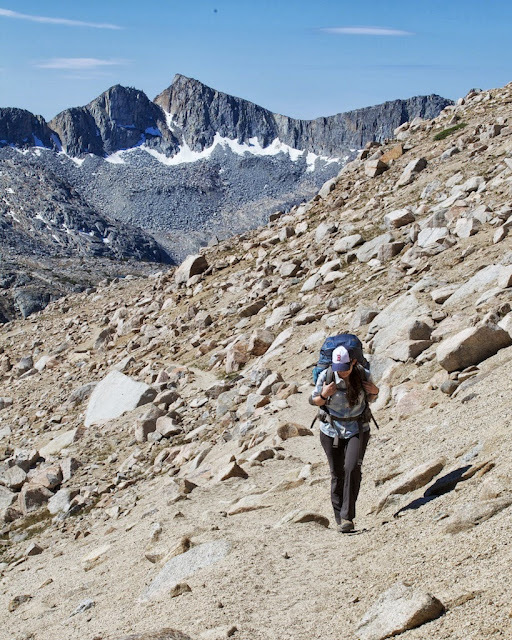 The first set is perhaps the most demoralizing because the top of the pass seems so high above, but the mix of thin air and steep terrain is likely to sap even the heartiest backpacker. Then we began a second set of steeper, narrower switchbacks which took us within a few hundred vertical feet of the summit. The last switchback ends with the final view of the Bishop Lake. After crossing a small patch of snow still hanging onto the top of the pass (though rapidly melting and slushy) we finally reached the sign - but still racing storm clouds we didn’t stop for more than a few seconds before rushing into our descent into Dusy Basin. The view from the top of the pass is fairly unremarkable actually, the first impressive views of Dusy Basin and the Palisades Range beyond wait about a quarter mile, and a few hundred feet lower, down the trail. From there though the view into the basin is incredible. Thin air and high alpine scenery all around with patches of summer snow clinging to the cracks in the mountains. 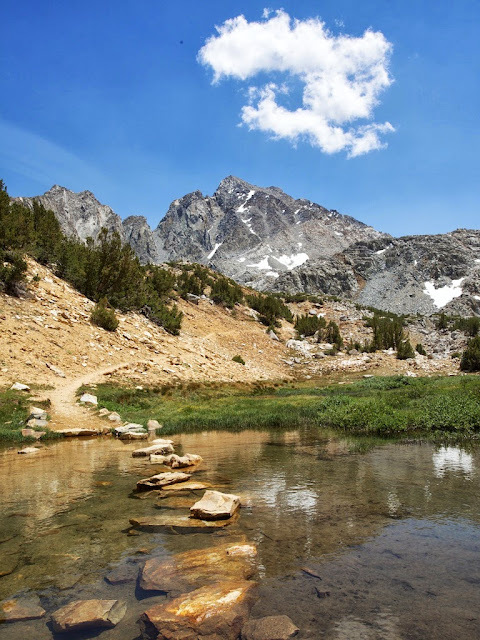 Dusy Basin truly is in the spine of the Sierra and every moment there is a treat. “uhh... what overnight parking lot?” we responded. We pulled into the lot in haste. We had not seen any instructions for parking and had not heard anything about this from the rangers in Bishop. We had NO IDEA what he was talking about - but now we were pretty concerned we might get a ticket. Ultimately we decided that wasn’t that big a deal, though it would be pretty annoying. After hiking about 3 miles into the basin we set up camp on a small rocky outcrop above another large lake below the tree line. 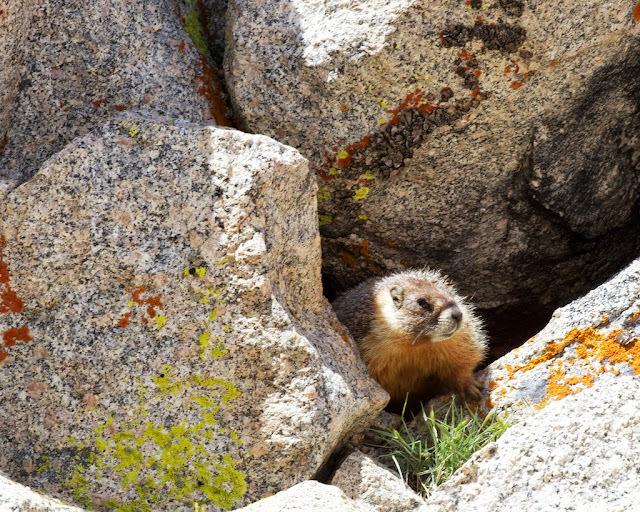 We were please to be camping in the thicker air, the strong winds, stormy clouds, and treeless landscape above had made us feel a little uneasy - plus we were now starting to worry about the car more. What if we get towed? Getting your car towed is the worst. The hours are intentionally inconvenient and of course do not include weekends, so if our car was in the process of being towed, we were not getting it back for three full days. All that with no mention of the fact our wallets were locked inside our car which we would have no access to. Basically, this was turning into an unmitigated disaster. Fruitlessly we tried to busy ourselves setting up camp - making dinner- and cleaning dishes - washing up - and eventually hitting the sack early. All we could think about though was the car, and the world of hurt we would be in if it was gone when we returned. The initial plan was to summit Mt. Agassiz, or another nearby peak on our second day in Dusy Basin. We had a permit to stay through most of the weekend. We were still in a state of panic though and instantly hoofed it up and over the pass first thing in the morning. Morning light in Dusy Basin from camp. The weather was practically perfect. Calm. Warm. Wonderful. 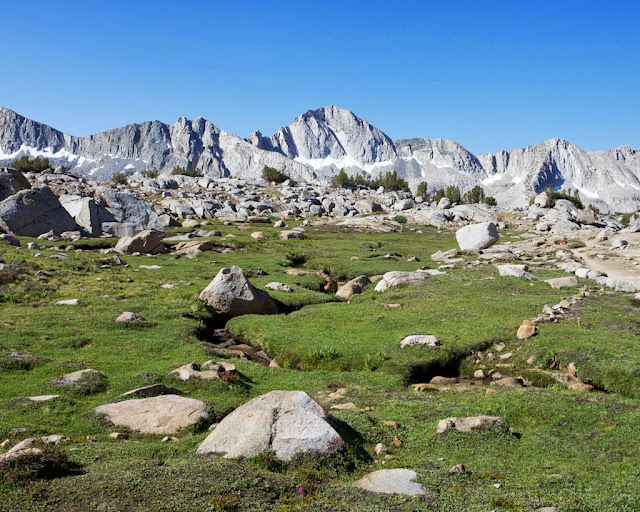 Sub-alpine meadow in Dusy Basin. 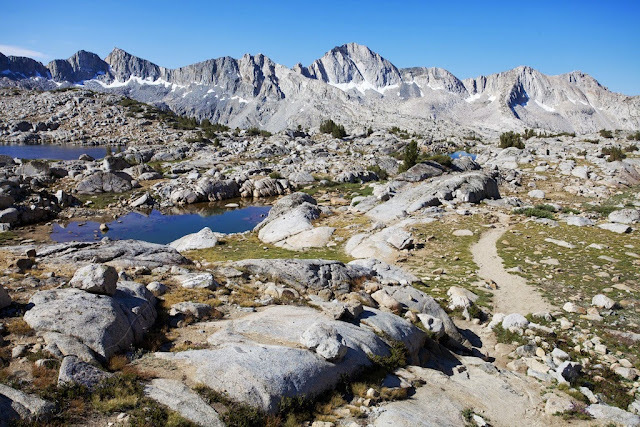 We skipped breakfast and started climbing out of Dusy Basin eventually reaching the top of Bishop Pass around 9 am. Just in time to chat up the first day hiker coming up the trail. We’d harass most of the hikers on their way up the pass before the end of the day asking if they remembered seeing our little car in the parking lot. None did. We blasted down the trail at pretty much full speed, hiking right through lunch. We paused only momentarily to wolf down some GORP, or fix our socks to prevent blisters. Eventually around 1pm we started hearing the engines of cars in the parking lot. Our pace picked up to a trot and my heart started racing. We hiked over one small incline and walked past the bathrooms. Two large SUVs obsured where I thought our car was parked so we had to get very close to confirm. “YES!!!! !” I screamed out in the parking lot. Pumping my arm a few times and jumping in the air. Beylah apologized to the scattering of hikers in the parking lot startled by my crazy yelling. Not only was our car not towed - we had parked correctly. I didn’t see any signs indicating there was no overnight parking when we initially pulled up because there were none. There was an overnight lot, but our spots were also free for overnight use. We decided after all the unnecessary stress to grab some fish tacos at the Woah Nelli deli and call it a trip and head back for the Bay. Lesson learned: always double check where you park before heading into the backcountry. Awesome pics! Also crazy how your mind latches onto something and intrudes on whatever you are doing. I have gone to movies and thought the whole time, did I leave the window down. I can only imagine what you were going through up there thinking about the car. At least it all worked out! Love the pics and detail! My husband and I are planning a one-year camping trip around the US and you have so many great hikes on your website. Which one has been your favorite so far? Have fun on your trip. If you have any specific questions about any of the hikes feel free to email me!